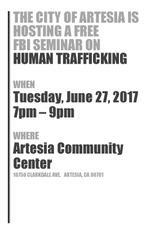 The City of Artesia is hosting a FREE Human Trafficking / Cyber Security Course tomorrow, June 27th! Please join us! Please join us for this exellent course on Human Trafficking / Cyber Security. If you have children with cell phones, you don't want to miss this! Tuesday, June 27, 2017, 7:00-9:00 p.m.